Nobscot's WebLog: What Do You Not Understand About Private & Confidential? What Do You Not Understand About Private & Confidential? 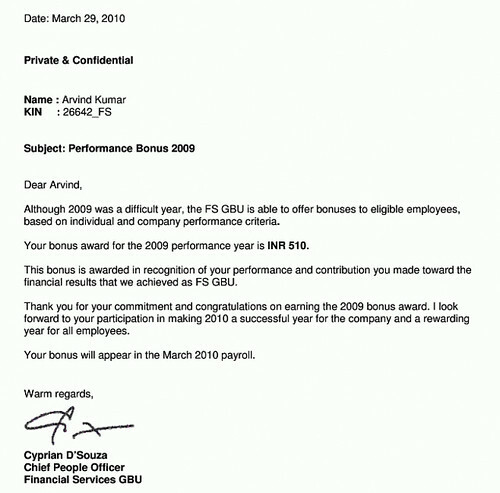 The link brings you to a memo from Capgemini to one its employees regarding his bonus award for 2009. It then follows with the employee's presumed response. In a gesture of kindness or sarcasm (the tweeter assumes sarcasm) the employee requests that the company keeps the bonus to help with any future financial challenges that the company may face. Your compensation details are strictly personal and confidential and should not be disclosed to others. It makes you wonder, doesn't it? Exactly what part of "private and confidential" does the employee not understand? I realize that we live in a new world and "openness" and "transparency" (oh, how I hate that word) are the watchwords of today, but if you receive a letter from your "Chief People Officer" as Mr. Kumar did that says the information is private and confidential, should you really be posting it and spreading it all over the Internet? If you were Cyprian D'Souza, Chief People Officer of Financial Services GBU and the signer of the confidential letter, how would you respond? Would you laugh it off or would you take disciplinary action? Or maybe something in between? What is an appropriate reaction from HR?